It’s March and that means it’s time to do a little – or a lot – of spring cleaning. Get ready to open your windows, let your house breathe and tackle the tasks that will make your home feel bright, clean and fresh after months of winter. 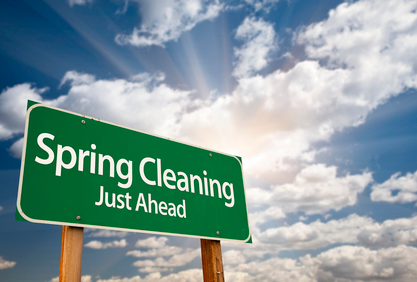 Whether you’re finally cleaning out the garage or shampooing the carpet, spring cleaning can be a lot to tackle. But it’s spring (! ), so you have the energy, right? Before you get too far along in your spring refresh, however, don’t forget to also do a little spring cleaning of your home’s air quality. So much of the essence of your home comes down to how clean and fresh it feels, and air quality can be a huge part of this. While you’re opening your windows and letting Mother Nature’s breeze flow through, give your air ducts and filter a quick check just to make sure everything looks clear. Spring is a terrible time for pollen and other allergens, and dirty air ducts can turn into dust traps—havens for mold and dirt build up, making you or other members of your household miserable. If you’ve noticed dust settling throughout your home, this could be an indication that your air ducts are not as clean as they should be. A clogged dryer vent can also can affect your air quality. Overtime, lint and debris can build up in the clothes dryer vent, blocking air flow and creating potentially hazardous conditions, including the possibility for an exhaust fire or carbon monoxide intrusion (with gas clothes dryers). According to the U.S. Consumer Product Safety Commission, more than 15,000 fires are sparked every year by clothes dryers. Once you’ve addressed the air you breathe, you might consider focusing on these other great places while spring cleaning. Tackle your closets and organize them! Swap out the winter clothes for summer ones while you’re at it. Bring spring inside by grabbing some flowers and potted plants. Purge the fridge and hose out your garbage containers. Wash the windows to let more of that sunshine in. Clean UNDER your furniture and appliances while you give your home a good dusting. Do a quick check of your smoke and carbon monoxide detectors to make sure they are working. And of course . . . Don’t forget to clean those gutters. Even if you have ample amounts of spring energy, it can be hard to find the time to do everything. Plus, although a lot of spring cleaning can be DIY, in order to properly clean vents and HVAC systems, specialized equipment is required to navigate the extensive ducting. If you are in need of professional dryer vent and or air duct cleaning, please contact LCS Kleen-Aire, and we can help you out! Please don’t ask us to organize your closets, though.